First year New Milford High School teacher Mrs. Westbrook has been tackling the Common Core in an engaging and innovative fashion. One major instructional shift required by the Common Core Curriculum Standards is the increased emphasis on the use of informational texts. As students engage nonfiction, they learn to grapple with complex ideas and arguments and use those ideas in forming their own opinions. One strategy for helping students meet these demands is the use of blogging to scaffold challenging texts and to encourage students to consider evidence and the perspective of others. 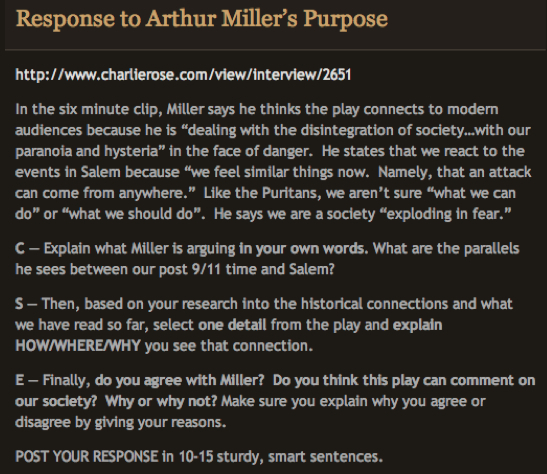 In the study of Arthur Miller’s The Crucible, Mrs. Westbrook’s class discussions have centered on the playwright’s purpose – a purpose the famous author described in a 2002 interview we use as our informational text for the lesson. 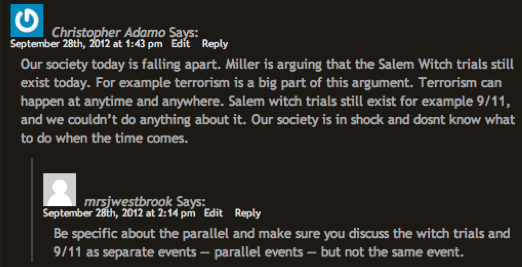 In the interview, the author presents a complex argument that links the events in the play to events in modern society. The blog assignment requires students to consider his argument, find evidence to support his argument in the play, and to evaluate the quality of his argument using their own observations. At the same time, the assignment provides a powerful learning tool. On the blog, students can access the informational text by replaying the interview. In addition, they can read salient quotes from the author to reinforce their comprehension. Finally, they can use teacher-generated questions to guide them in crafting a thesis-driven response to the author’s argument.